“There is no reason for any individual to have a computer in his home.” — Ken Olsen, co-founder of Digital Equipment Corp.
“640K [bytes of memory] ought to be enough for anybody.” — Bill Gates, founder of Microsoft Corp.
“I think there is a worldwide market for maybe five computers.” — IBM President Thomas J. Watson. Granted, these quotes come from the early days of tech … back when the personal computer itself was a disruptive technology poised to change the world forever. We are on the verge of another disruption in technology. The advent of online streaming entertainment is set to rock the cable/satellite TV business to its core. You would think that technology companies would have learned their lessons by now. Such is not the case. Once again, we find similarly short-sighted statements from technology companies clinging to the status quo. In fact, Stephens reiterated AT&T’s company line from September when it first warned about subscriber losses. He blamed it on the weather. Don’t get me wrong. Seasonal issues and hurricanes can have a real impact on subscriber numbers. But AT&T didn’t only lose 90,000 subscribers due to natural disasters. It lost 390,000 traditional pay-TV subscribers in total. Those 300,000 subscribers that AT&T didn’t talk about signed up for the company’s DirecTV Now online streaming service. So, while the company only technically lost 90,000 subscribers, it lost a great deal of revenue from customers cutting the cord with their traditional service and going with a cheaper online option. As I’ve pointed out before, online streaming is only gaining momentum, and will eventually outpace traditional cable-TV services in both subscribers and revenue. Because of this, AT&T is in a world of hurt, and it’s already showing in the company’s earnings report. Revenue was down more than expected in the third quarter, falling 3% to $39.67 billion. While the company may indeed see a bump in the fourth quarter, likely due to the holiday season, expect things to get worse heading into 2018 for AT&T’s traditional pay-TV services. If pay-TV subscribers were AT&T’s only issue, it might not be in too much trouble. But the company’s other major moneymaker, wireless, is losing ground as well. AT&T reported 900,000 fewer cellphone upgrades in the latest quarter. The blame fell squarely on Apple. Industry analysts believe that customers are putting off upgrades until Apple’s iPhone X launches. Furthermore, AT&T lost 97,000 monthly wireless subscribers. It’s another situation that is only going to get worse … especially with companies like T-Mobile offering free Netflix with its unlimited data family plans. At this point, the Time Warner merger will only help AT&T play catch-up. And only for so long, as Sprint and T-Mobile are once again entertaining a merger. All in all, this places AT&T far behind the game, and on the hook for an expensive Time Warner buyout. As a result of AT&T’s third-quarter earnings report, T stock is trading down sharply and is hovering just above two-year lows. Furthermore, the shares remain mired in bear-market territory beneath both their 50- and 200-day moving averages, and this post-earnings plunge has just dug an even deeper hole to climb out of. 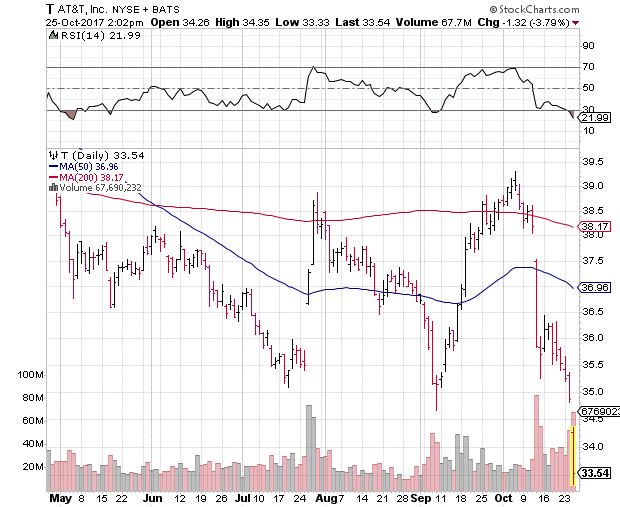 That said, shorting AT&T right now would not be a great idea. The shares are trading in oversold territory, and Wall Street analysts are sure to emerge to defend the stock in the weeks to come. A short-term bounce is certainly not out of the question. If you are looking to short T stock, wait for the shares to retest either their 50- or 200-day trendlines. Even positive news on the Time Warner front would have a hard time pushing T shares north of these moving averages at this point. Editor’s Note: As a nuclear missile architect for the U.S. Air Force in the late ‘80s, Michael Carr wrote the computer code that made sure each missile would hit its target with 100% accuracy. He designed his trading strategy the same way, perfecting it over the last 10 years to provide a steady string of 100%-plus gains … in as little as two weeks. However, Michael’s Peak Velocity Trader research service will only be taking new subscribers until tonight at midnight EDT, so click here to check it out right away.